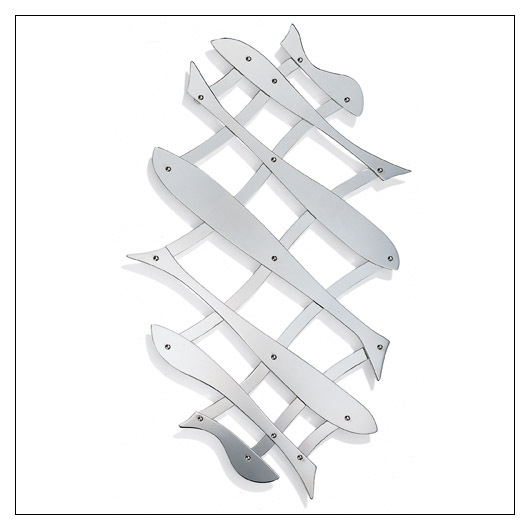 Alessi Pescher Extensible Trivet - Fish Pattern (ALPESCHER) at Pure Design / Accessories / Kitchen ::: Furniture for the Home, Office, Home Office, and More at Pure Design Online! Pop, humor and smart design, three cornerstone themes in the lengthy design history of the D’Urbino and Lomazzi duo, who are back with a new version of the trivet. The interest and intrigue of the "Pescher" Extensible Trivet comes from its truly unique and abstract fish-like design. Introduced by Donato D'Urbino and Paolo Lomazzi, it is made from many separate jointed interlocking shapes of stainless steel, to form a trivet that can be expanded for hot dishes of many sizes.